April | 2011 | Chip Chip Hooray! Whether you celebrated Easter or Passover or simply the arrival of a disconcertingly large rabbit last week, chances are you noticed some sort of seasonal cuisine. This season brings with it such tasty morsels as pizza rustica, hot cross buns, and anything matzo. My tastes, I’ll admit, are a little less refined. Unless we’re talking refined sugar. Then we’re getting somewhere. 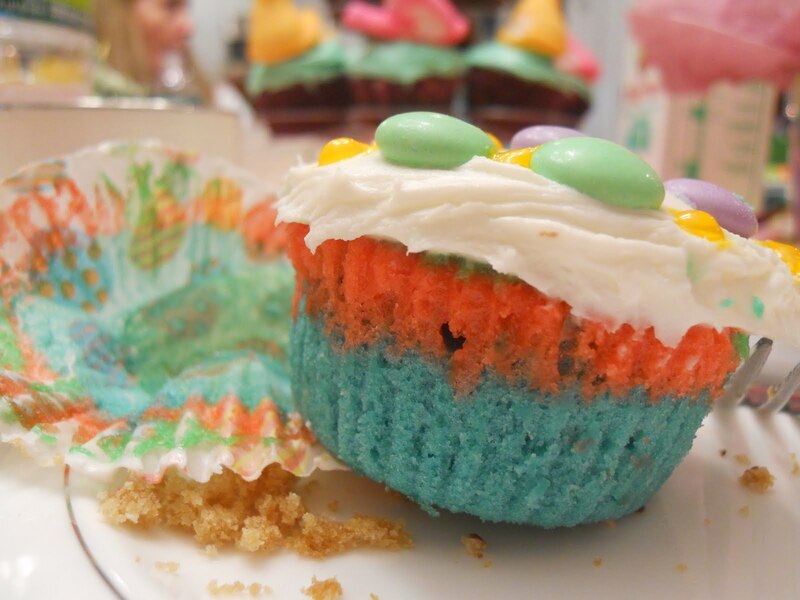 This colorful cake above is only the beginning of the Easter baking fun the Little Chips and I had last weekend. Follow the jump for more adventures in cupcakery! "The most dangerous cake recipe in the world…"
Well, it’s another manic Monday. Although my day way bookended by events that normally would bum me out (namely, (a) my eyeliner broke at 6 a.m. so I looked either extremely ill or like an insomniac all day long and (b) the LIRR had massive delays system-wide thanks to a stall in the tunnel, so I had to make a mad dash via an express subway to Brooklyn and hope I made a different connection there [I did]), I am still flying high from my awesome weekend. Why so awesome, you ask? Well, my delightful college roommate sent me a message at 11 p.m. on Friday night, putting forth the proposition that we go back to campus to visit. The next day. As in, I would get on a train in eight hours and come meet her in NJ and we’d head to PA together. But on Friday, I asked myself, “Why the hell not?” I had no plans this weekend. I haven’t seen my roommates in forever. And it just sounded like fun. So I threw some clothes in a beach bag, grabbed a few hours of sleep, and hopped on a train at 7:30 the next morning en route to good old alma mater. I think I need to start incorporating more impulsiveness into my life. We surprised a bunch of people who had no idea we were coming, braved a monsoon just to get from campus to the car, and ate pizza and chocolate eggs at 3 in the morning. Glorious, simply glorious. Happy Friday! In honor of the weekend (weekend), you could watch this video. Or, if your brain cells can’t take it anymore, you could look at these yummy (yummy) pictures and plan your next cupcake excursion in New York. I know which one I’d pick. But that’s just me. What a lovely Friday treat! Clearly we’d already started to indulge when I whipped out my phone to take this picture. 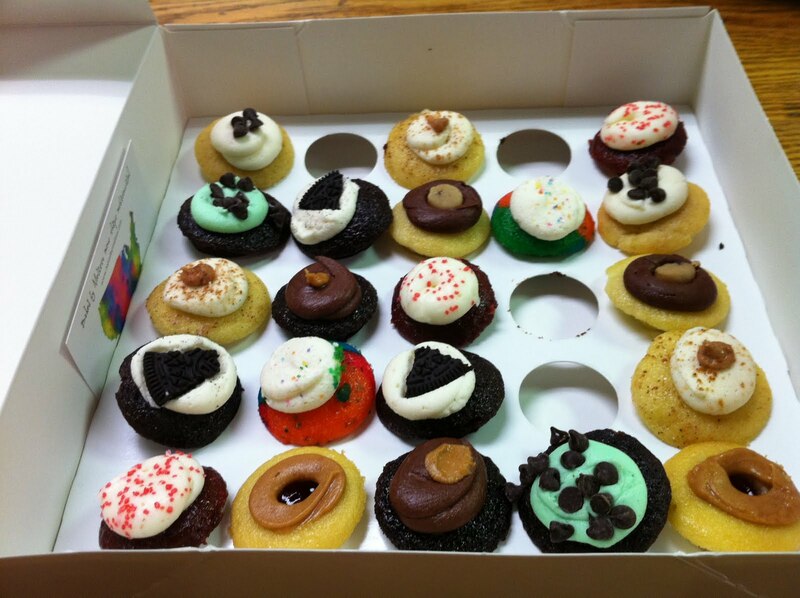 Know what my favorite part of mini cupcakes is? You can eat a bunch of them and they all add up to one regular cupcake. True story. Above are my initial two choices, and both were scrumptious. All of these cupcakes had a super moist cake–one of my coworkers commented that they almost didn’t look like they were done cooking (they were; never fear). 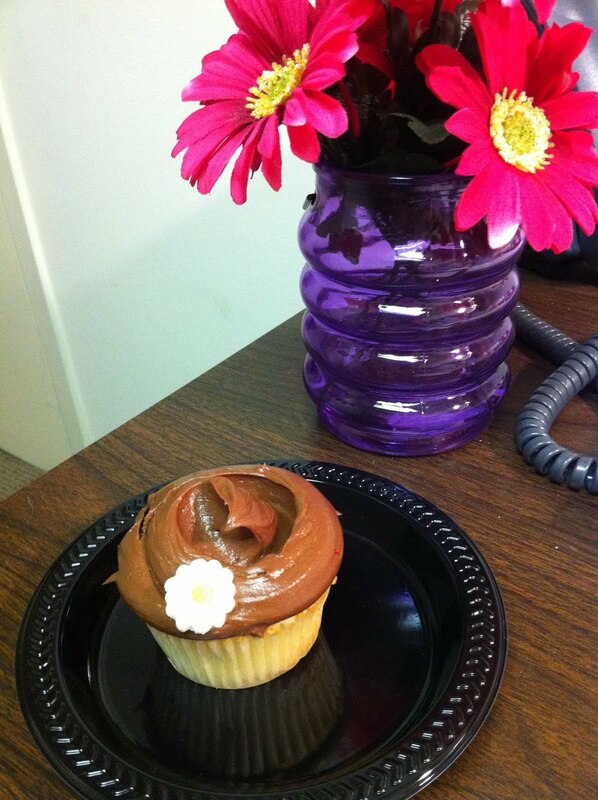 But as a girl who’s had many an unfortunate crumbly cupcake, I’ll take that just-baked taste any day. Also, in spite of their deceiving size, the majority of the cupcakes were filled! So the S’mores cupcake had a tiny bit of graham cracker inside, and the Cookie Dough one was packing another little daub of dough like the one you can see in the picture. 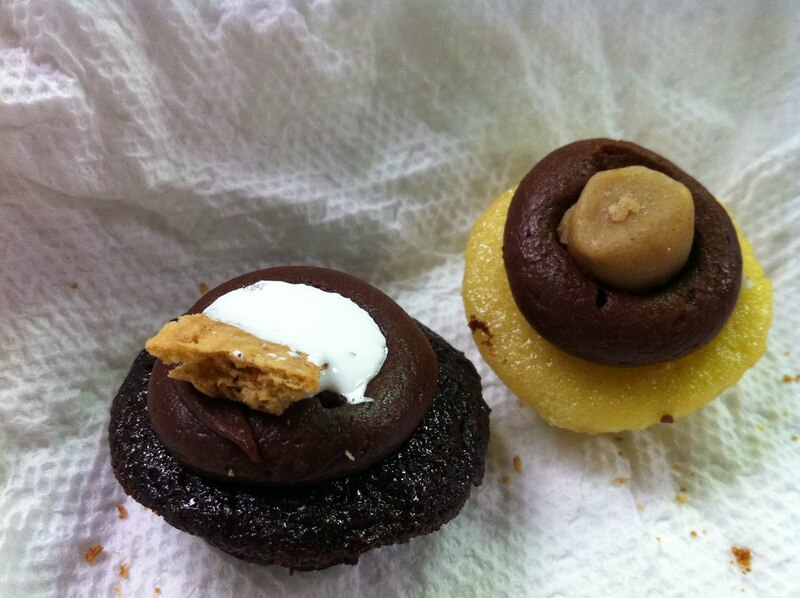 The icings on both were also spot-on–that delicious fudge-y chocolate that’s not quite a ganache but richer than a buttercream. Mmm. And it tasted like it! Now, perhaps you’re not interested in the uncanny experience of eating a pancake in cupcake form. (I don’t know why you wouldn’t be.) 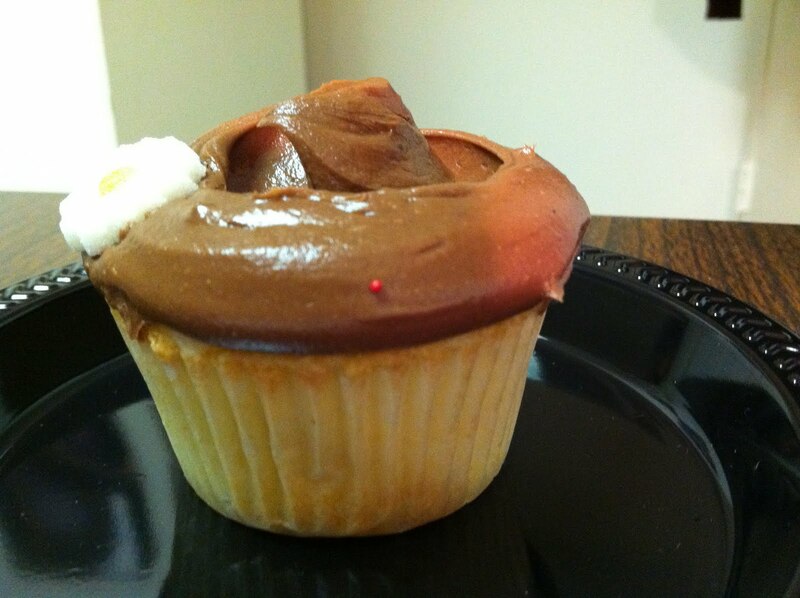 But if you are, this cupcake somehow made that magic happen. Thankfully (or not so much), I was able to stop myself at three. But according to my fellow noshers, all of the other flavors were equally divine (Red Velvet was lauded in particular). If you’d like to celebrate spring’s arrival (finally), or maybe just escape the April showers, Baked by Melissa has not one, two, or three, but four locations in NYC! Chances are, there’s one near you. And if there isn’t…I mean, that’s what lunch breaks are for, right? 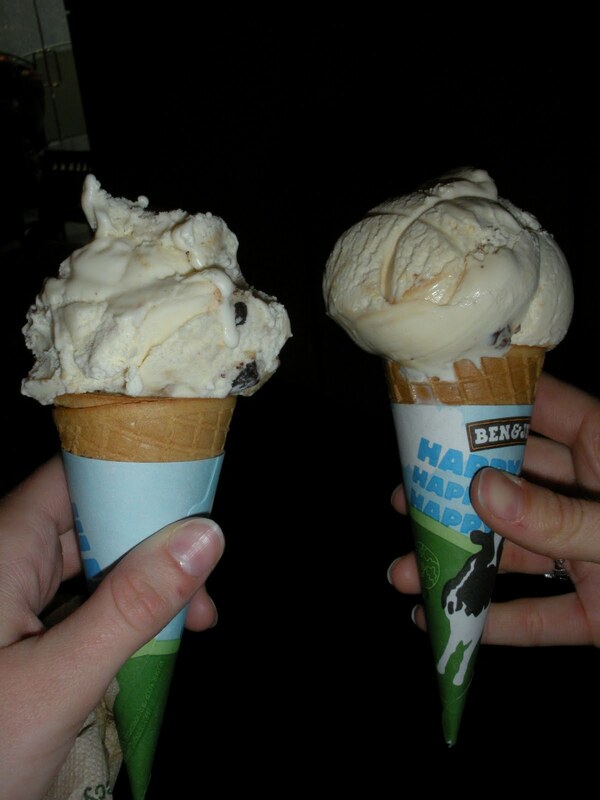 So, today was Ben & Jerry’s Free Cone Day. Chocolate Chip Cookie Dough on the left, and Triple Caramel Chunk on the right. I know you’re jealous. It’s cool. I’m just gonna leave it at that. I ask you this question: What does one do on a weekend evening with no plans and nothing on TV? Obviously, one bakes three batches of cookies. And, since one is bored and lonely, one convinces Baby Chip to help by giving her the job of Baking Photographer. Thus, all photo credits for this post go to my aspiring photographer sister. I did not throw myself in front of a passing city bus because my dear Middle Chip brought me a cupcake from Magnolia Bakery. Vanilla cake with chocolate buttercream frosting. 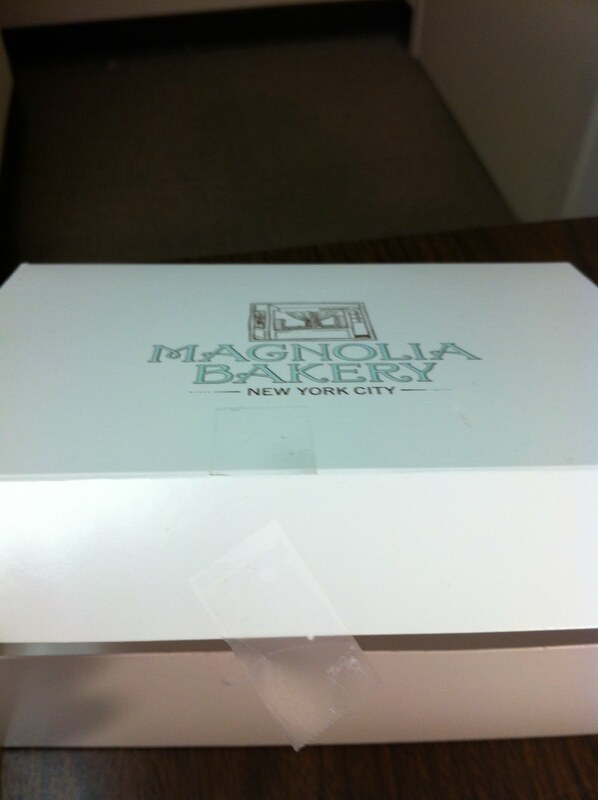 In its own jaunty little Magnolia Bakery carrying case. I may or may not have shut my office door at 4 p.m. to eat my cupcake in peace because it was the bright spot in my life at that moment. So, dear sister, thanks from the bottom of my heart to you. I think the cute boxes are half the reason I like boutique cupcake shops so much. Okay, maybe 25%. Bringing much more joy and happiness to my office than my fake gerbera daisies ever can. I’m sure most everyone is aware of the cupcake craze that’s swept the American food industry. Cupcakes are the new cool kids, and boutique cupcake stores can be found in literally any town or city. Does that make me any less interested in sampling as many delicious cupcakes as I can. Hell no. I’ve been hearing about the wonder that is Robicelli’s for some time now. 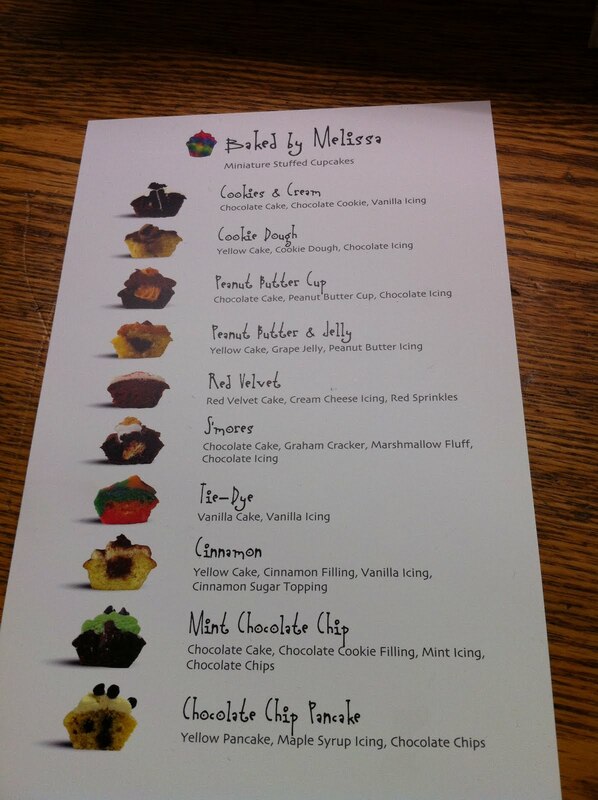 A rotation of cupcakes with flavors like Rue McClanahan and Butterbeer? Whose interest (and taste buds) wouldn’t be piqued? So when I happened to read last Friday that Robicelli’s had started stocking at Joe in Grand Central Station–aka the very location where I happened to be getting dinner that evening–I knew it was fate.